February’s issue of ELLE highlights sustainable fashion in “How These Three Designers Make Old New Again.” By crafting garments from vibrant vintage kimono silks, Arcana gives new life to one-of-a-kind textiles. Read the article here. Creative: Laura Jones // Photographer: Guy Lowndes // Styling: Ryan Jude Lobo for Tome // Hair: Larry Jarah Sims // Make Up: Fiona Stiles // Nails: Millie Cosmo. We've been fans of Naomie Harris since her zombie-killing days in 28 Days Later. Did you know she's also a champion of sustainable fashion? New sustainable-fashion magazine The Frontlash featured our Chrysalis Bodice in ochre chirimen in their debut issue, and we couldn't be more honored! Read the interview with Naomie here. "This brand may be based in the Big Apple, but their gorgeous eco clothing has grabbed the attention of stylish environmental enthusiasts worldwide thanks to their attention to detail and carefully-sourced, beautiful textiles. Not only are their materials sourced with special attention paid to the location and carbon footprint of the product, they’re also committed to supporting local communities across the globe with their unique approach to design. Each garment uses indigenous artisan textiles that bring a unique atmosphere and cultural diversity to every piece they sell." Photo of Arcana's Seeker Peg Trouser courtesy of Idun Loor. Arcana New York showed the Lilith Convertible Slip Dress, Chrysalis Bodice, and Bone Clocks Trouser at New York Fashion Week with designer collective Flying Solo. Read the article here. Cools.com interviews designer Arianna Reagan in the Arcana New York studio. "Autumn/Winter Trends the Ethical Way"
"Sustainable Womenswear: Arcana NYC SS17 Collection"
"Whether you’re wearing an off the shoulder top or high waist skirt, the finishing touch for those autumn afternoons is the bomber jacket from Arcana NYC." 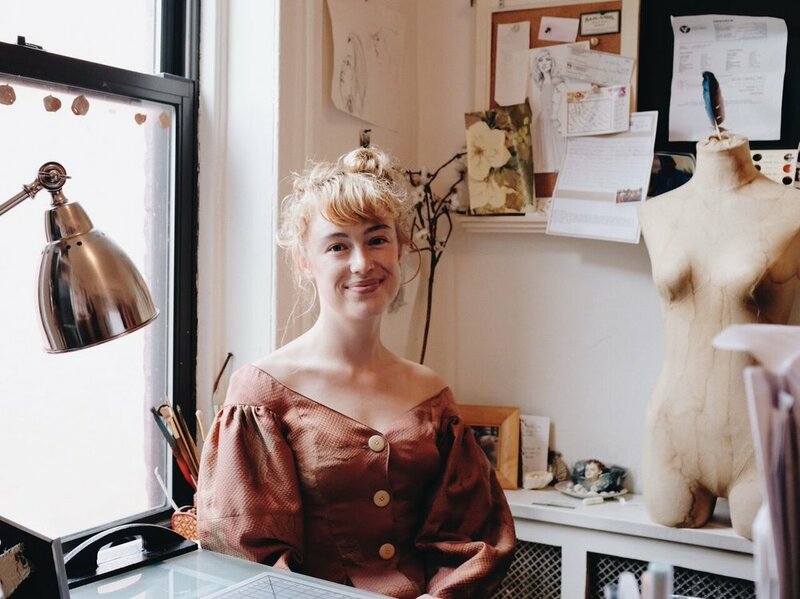 Fashion stylist, blogger and designer Emily Tillery put the spotlight on Arcana in her latest post, "Designing Sustainably." Learn about Arcana's approach to sustainable design and see shots from the photoshoot modeled and styled by Tillery here. Luxury lifestyle publication Fairweather Magazine interviewed Arcana designer Arianna Reagan on her journey into the fashion industry and her approach to sustainable design. "We search for the fresh face who understands the importance adding edge and modernity to keep fashion moving forward. To truly be someone worthwhile, a designer must have not only mere talent, but also absolute passion. In the case of Arianna Reagan of the Arcana NYC, that passion exists for both the art of fashion as well as the health of our planet." Read the full interview here.